These hold approximately 24 oz of nectar. 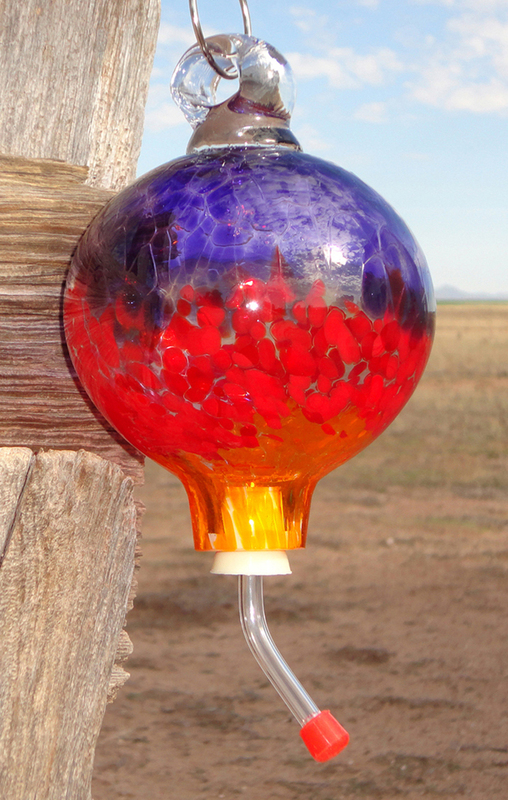 The hummers just love our brightly colored hand blown glass hummingbird feeders. 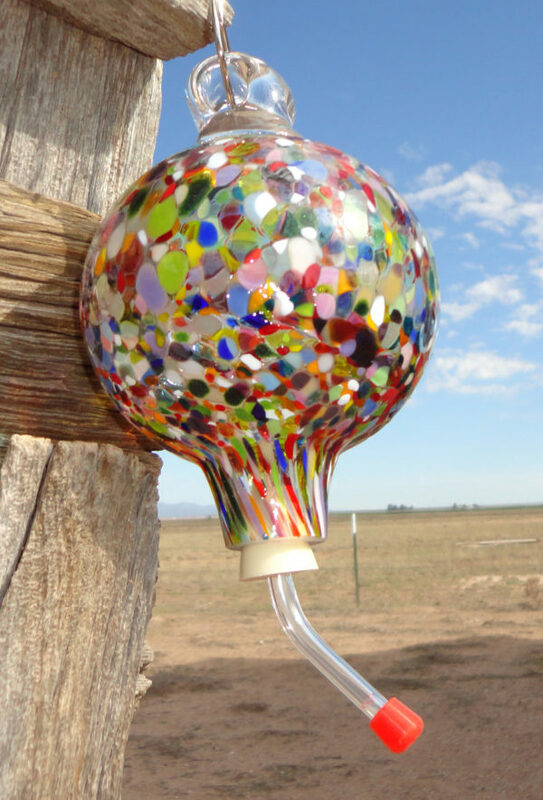 Watch them from your window as they buzz around and drink from our one of a kind works of art. 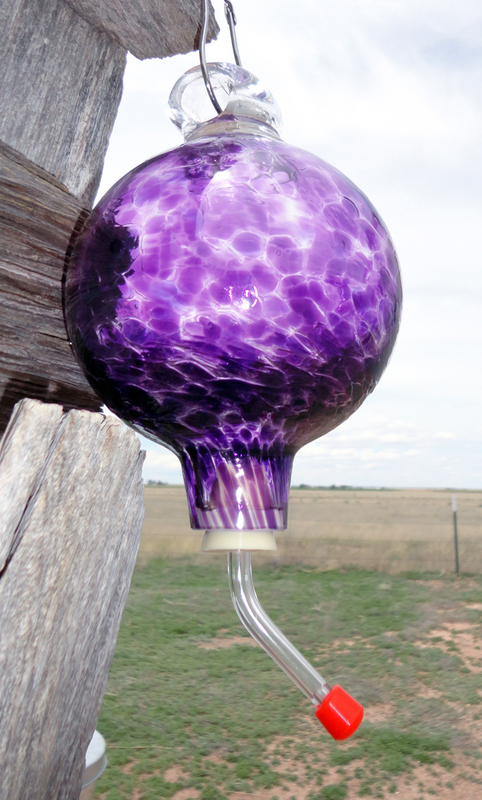 We blow our glass hummingbird feeders extra thick, with a stout hook on the top, designed to withstand the elements. 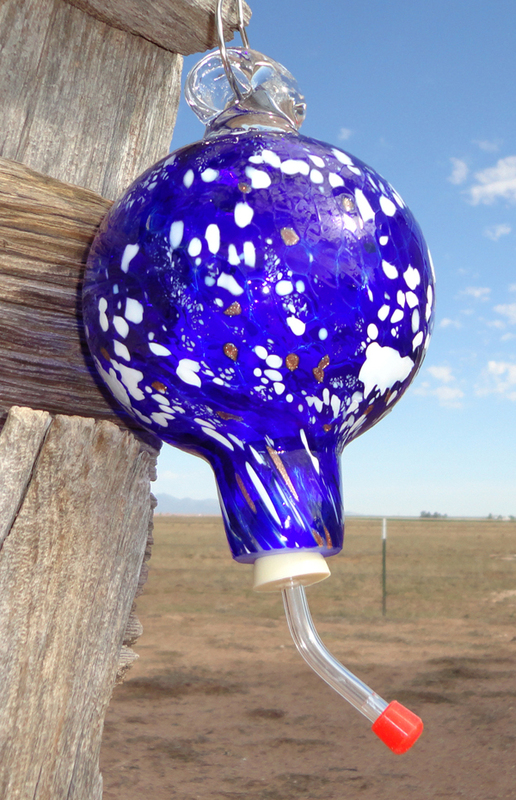 You never have to worry about a glass hummingbird feeder made by us! 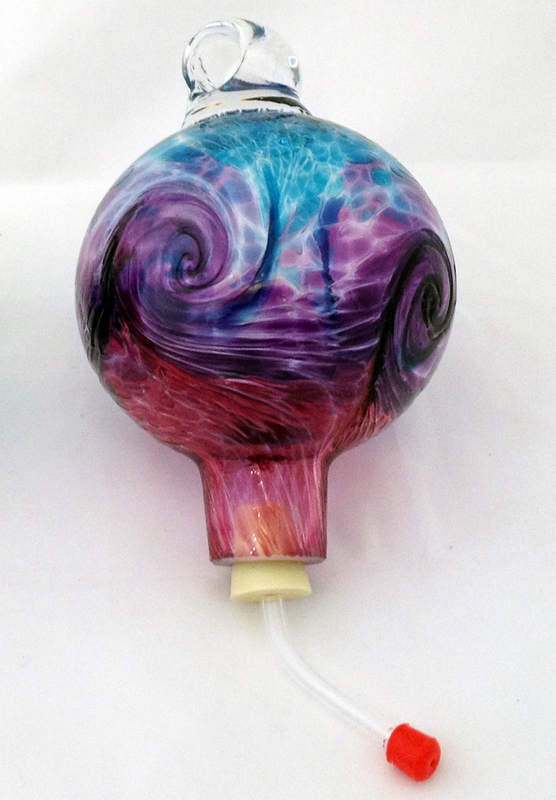 As for the capacity, they hold approximately 24 oz of fluid but are all hand blown. 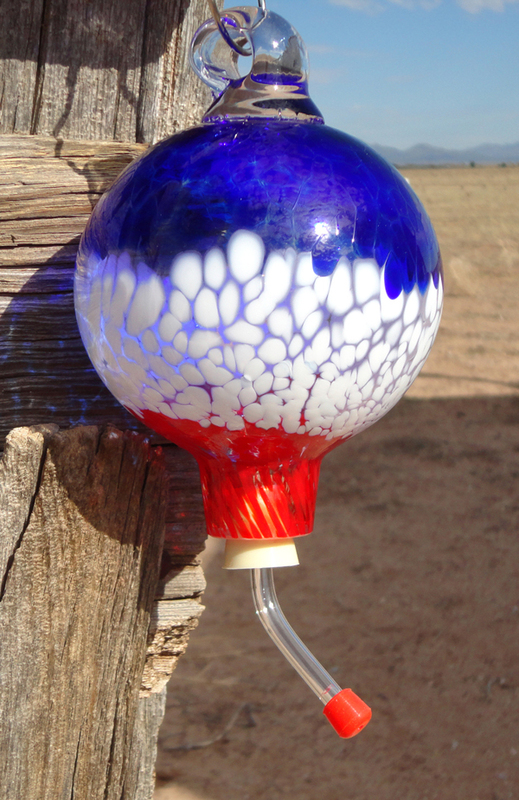 Keep in mind the size can vary slightly from one feeder to the next. Its always best to measure the capacity, filling up with water first, then make a little extra nectar and store in the refrigerator for quick refilling. For more information about caring for your feeder, see additional tabs on this page. Be sure to look at additional color options on the stripes and mixed colors pages. You can make your own nectar by dissolving one part granulated sugar in four parts boiling water. Cool and refrigerate until you’re ready to fill your feeder. Do not use artificial sweeteners. They contain no nutritional value and could cause severe malnutrition, especially if used for a long period of time. 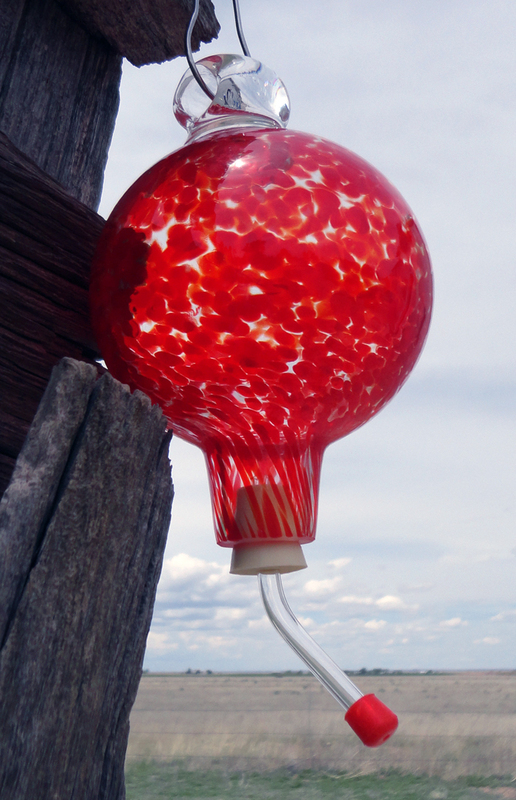 Do not use red food coloring as this also has not been proven safe for the hummingbirds. 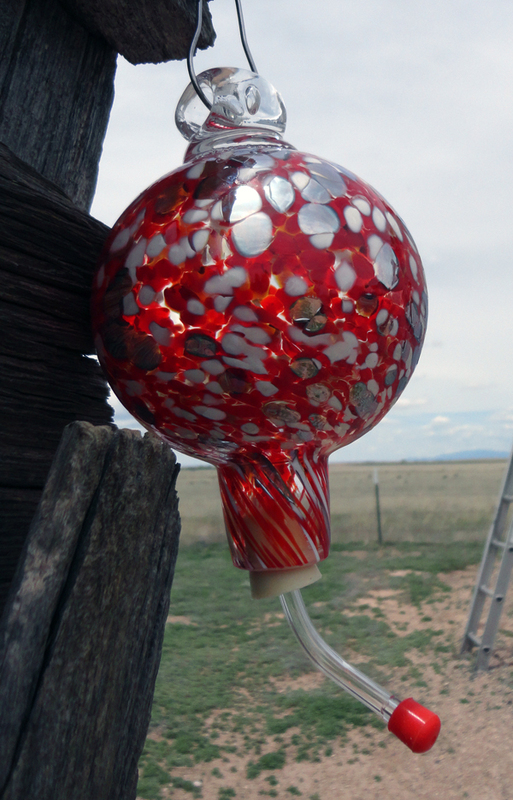 We put red color in most of our designs and the tip of the stopper is also red to attract the birds to the place they need to feed from. When you introduce the feeder to your yard, place it in an open area so birds can easily access it from all directions. 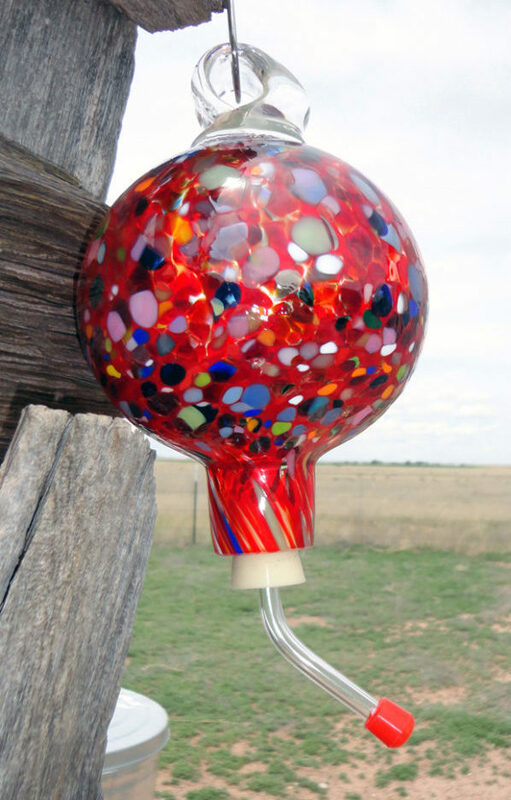 You may wish to place the feeder near natural feeding areas such as shrubs and gardens. Once birds have discovered the feeder, you can gradually move it (a few feet each day) to your preferred viewing spot. 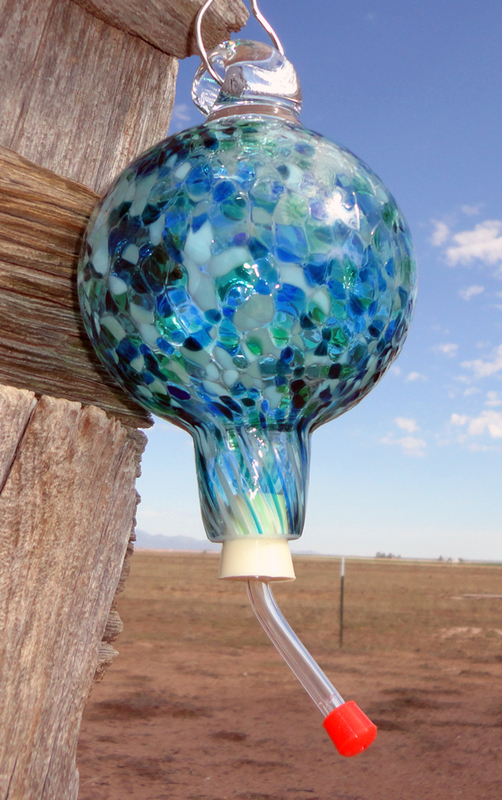 A stopper-style feeder stays leak-free only if it is kept airtight. 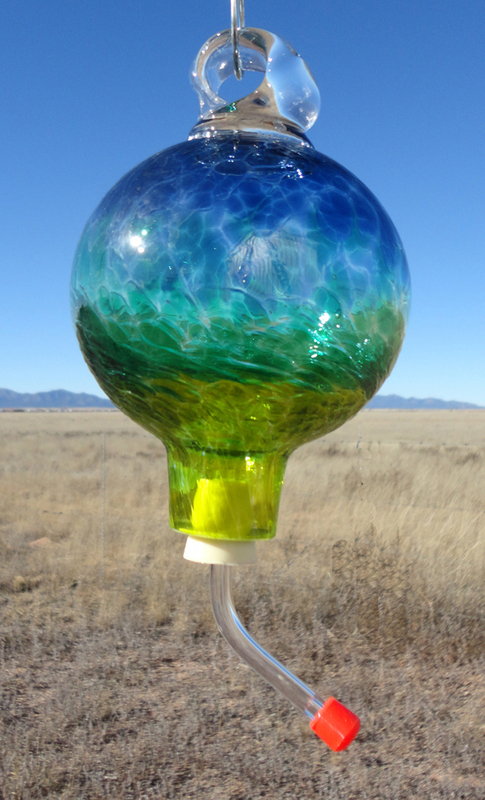 If air bubbles get in, nectar can trickle out the end. 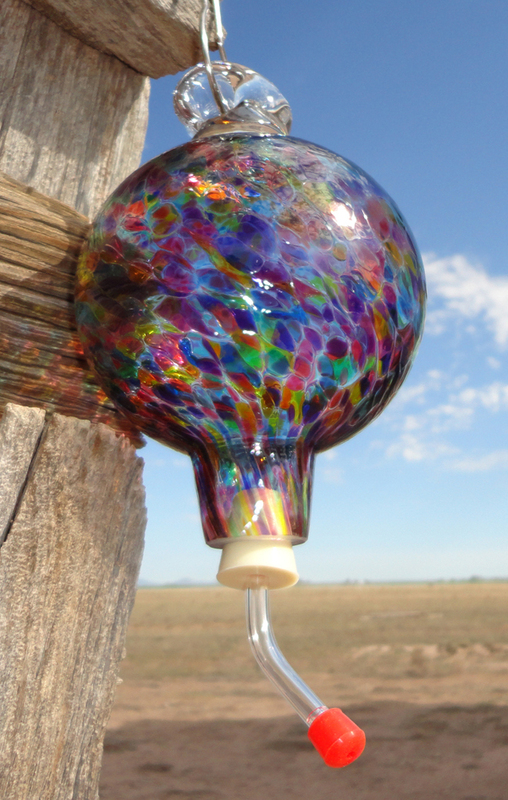 Each time you fill it up, pour nectar all the way to the very top, almost overflowing it. Place the rubber stopper firmly into the feeder opening. 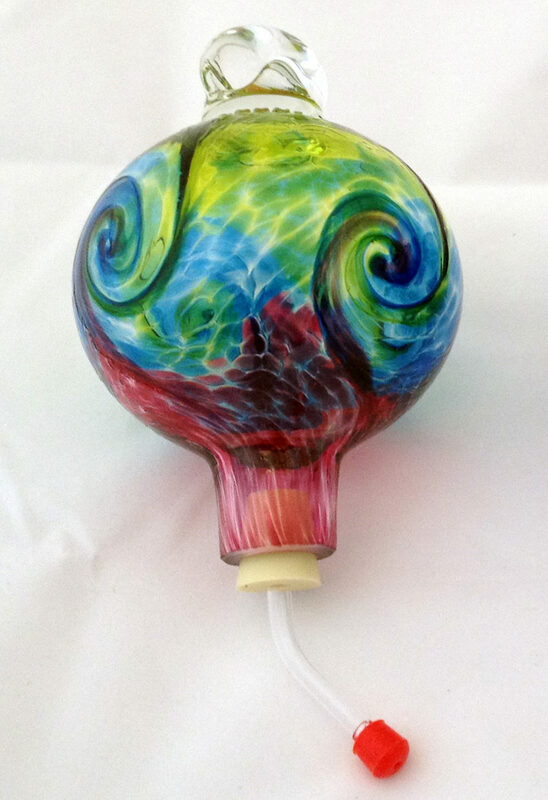 You will see nectar squirt out the end of the stopper and all the air has now been removed from the glass. 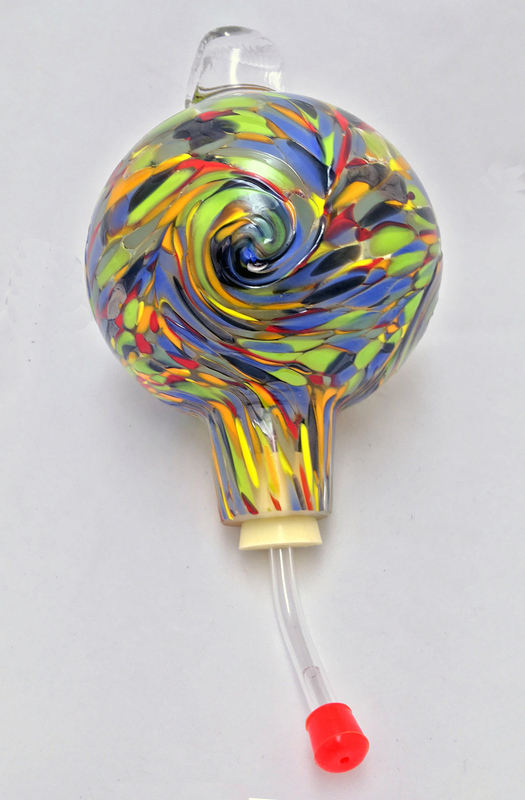 By doing so you have created a vacuum which holds the nectar in the bulb. Change the solution once a week regardless of whether the feeder has been emptied. Nectar left in a feeder over long periods of time could ferment and cause birds to stop feeding. Do not leave any soapy residue when cleaning your feeder as this may cause birds to stop feeding. Just hand wash with warm water and rinse the feeder really well. You may use a bottle brush or paper towel to wipe away any residue inside the glass. 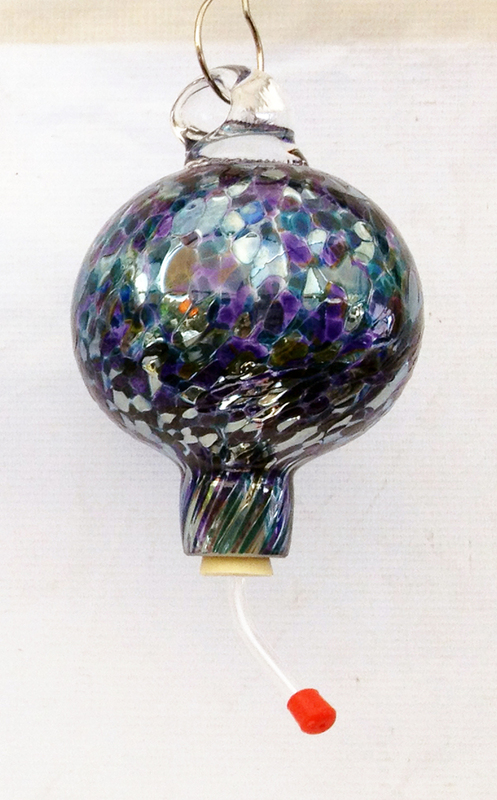 Do not use a dishwasher to clean your feeder as the extreme heat could cause the hand blown glass to crack. 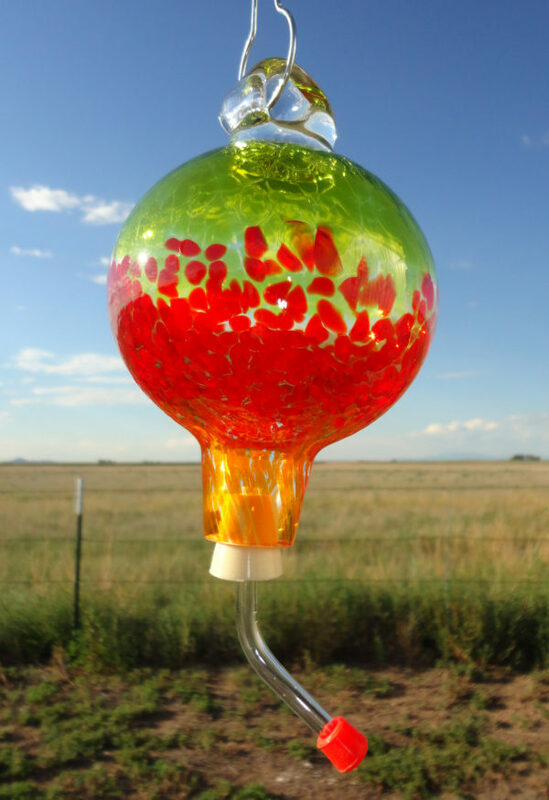 Keep in mind that hummingbirds are attracted to flower colors and nectar, not fragrance. Some cultivated hybrids produce less nectar than their wild counterparts, but they still make excellent additions to your hummingbird garden. §Bee balm Monarda didyma §Tuberous Begonia Begonia sp. §Butterfly weed Ascelpias tuberosa §Canna Canna sp. §Cardinal flower Lobelia cardinalis §Gladiolus Gladiolus sp. §Coral bells Heuchera sanguinea §Montbretia Crocosmia sp. §Delphinium Delphinium elatum §Bougainvillea Bougainvillea sp. §Fuchsia Fuschia hybrida §Honeysuckle Lonicera sp. §Geranium Pelargonium species §Lantana Lantana sp. 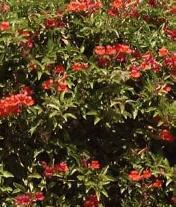 §Scarlet sage Salvia splendens §Azalea Rhododendron sp. §Four-o’-clock Mirabilis jalapa §Flowering quince Chaenomeles sp. §Flowering tobacco Nicotiana alata §Hibiscus Hibiscus sp. §Nasturtium Tropaeolum majus §Lilac Syringa sp.